The SNA Inc. Seawind 3000 is four-seat single-engine amphibian aeroplane. The Seawind 3000 is a composite aircraft with a single tail-mounted engine and was produced in kit forms and as fully built in Canada and the United States. Development of the Seawind started in the early 1970s, when Roger and Len Creelman in Haliburton, Ontario, began laying down their concept for an affordable, roomy and strong amphibian for use in the backwoods. After the first steps in the development of the aircraft also Leonard Creelman's son Kirk became involved in the project. The concept resulted four prototypes. The first prototype was built of aluminium and wood. This prototype never flew as the the 135 hp Franklin engine was not enough. The second prototype was glass-fiber reinforced composite built and powered by a 200 hp Lycoming IO-360 engine. As originally designed, the main landing gear retracted into the hull behind the step. This prototype flew only 15 seconds and then crashed. The third protototype, c/n RA-3, featured changes to the hull and sponsons and first flew on 23 August 1982. Following its maiden flight in Muskoka, Ontario, the aircraft, registered C-GFNL, was shipped to Ottawa for testing on land. In the spring of 1986, after 95 hours the C-GFNL was retired and registration C-GFNL was cancelled on 14 January 1987. Later development and production was carried out by Seawind International of Haliburton, Ontario, Canada, before the rights were acquired by SNA and production moved to Kimberton, Pennsylvania, USA. The Seawind 2000 was the first kit prototype, powered by a 200 shp Lycoming IO-360 engine and built by Composite Aerospace Development. Although top and cruise speeds were respectable, SNA felt that the aircraft needed more power. A 300 hp engine was installed and in addition to the larger engine, the Seawind 3000 had changes to the hull and step configuration. The Seawind 2000 canopy was hinged to allow opening from either side while the Seawind 3000 was hinged to open at the back. In late March 1993, the Seawind 3000 flew first flew. On 3 April 1993, this prototype crashed during testing on 3 April 1993. After several routine tests, the pilots attempted to simulate an engine-out situation reducing the engine power and setting the prop pitch to high. However, due to a malfunction, the propeller went into reverse pitch. This caused excessive drag and prevented the propeller from windmilling and forced the crew to a high speed landed in rough terrain short of the runway. Although the aircraft suffered extensive damage, both crew suffered only muscle strains. The crash also showed the strength of the composite structure and the vertical fin/engine pylon arrangement. The prototype was rebuilt with a non-reversible constant speed propeller and testing resumed in December 1993. The production versions of the Seawind line consist of the kit-built Seawind 2000 and its succesor Seawind 3000, with about 80 built aircraft. In 2002, Seawind stopped making the model 3000 kits to begin concentrating on a certified 300C airplane. Seawind LLC, Kimberton, Pennsylvania, USA, was formed to certify the Seawind design as a complete aircraft and market it as the Seawind 300C. The Seawind 300C is to be built by Sea Air Composites, Inc., with the manufacturing facility located at Saint Jean Airport in Saint-Jean-sur-Richelieu, Quebec, Canada. By the end of 2015, the certification of the Seawind 300C was still not finalized. In October 2002, the SNA Inc. Seawind 3000 was registered LY-LHS in Latvia with L.H. Strey, Zanzibar. As serial number for the aircraft was given "NÉRA", which means that there was no serial number. But in fact the aircraft was the Seawind kit # 142. On 8 January 2007, registration LY-LHS was cancelled. On 31 August 2013, the Seawind 3000 was seen at Lelystad Airport in the Netherlands still with registration LY-LHS on the tail and with Dynamic Aviation aircraft maintenance titles on the wingtips. On 29 January 2014, the SNA INC. Seawind 3000 was registered PH-LHS with L.H. Strey, Zanzibar, this time with c/n SW0142. 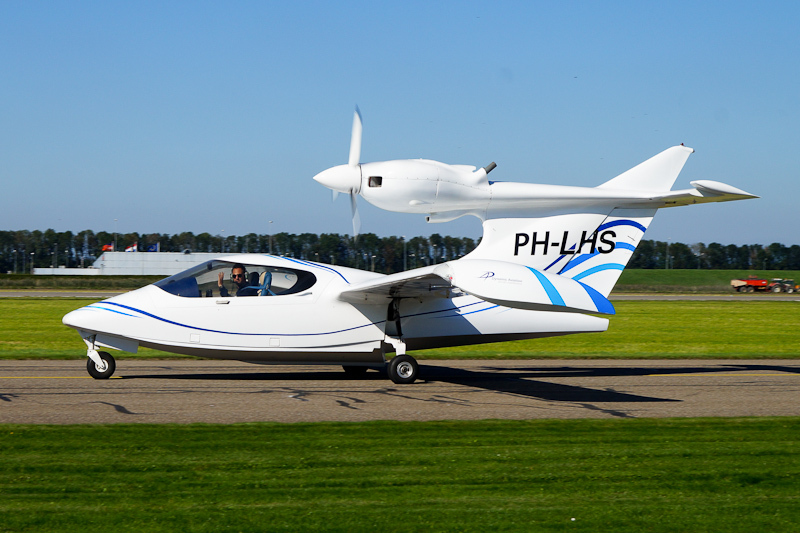 On 1 October 2015, the Seawind 3000 PH-LHS was seen at the taxiway of Lelystad Airport.